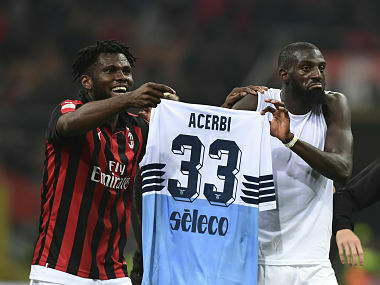 Milan: Felipe Caicedo and Ciro Immobile scored as Lazio beat Roma 3-0 in the capital-city derby on Saturday to revive their hopes of Champions League qualification from Serie A.
Simone Inzaghi's men ended their bitter rivals' eight-match unbeaten run in the league to move only three points behind Eusebio Di Francesco's fifth-placed team in the race for a top-four spot, with a game in hand. Victory at the Stadio Olimpico for Lazio also pulled them within six points of fourth-placed Inter, with AC Milan one point further ahead in third after beating Sassuolo earlier on Saturday. 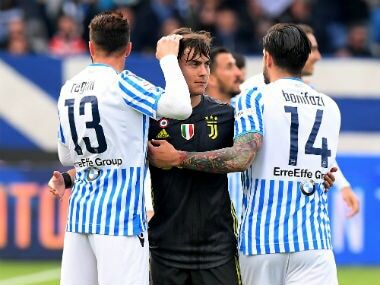 "This meant a lot to us and the victory can give us so much enthusiasm going forward The fact remains, Lazio can cause every opponent trouble and we'll fight it out to the end if we always go out there with this conviction and this heart," Lazio coach Inzaghi told DAZN. Lazio coach Simone Inzaghi's decision to leave Immobile on the bench took less than 12 minutes to pay dividends as Joaquin Correa played in Caicedo, and the former Manchester City striker rounded visiting goalkeeper Robin Olsen before tapping in his fourth league goal of the season. Roma were much improved after the interval, with Stephan El Shaarawy and Nicolo Zaniolo both bringing saves from Thomas Strakosha. Alessandro Florenzi was the next to go close, as his long-range strike was tipped over by Strakosha, before Javier Pastore wastefully fired wide. 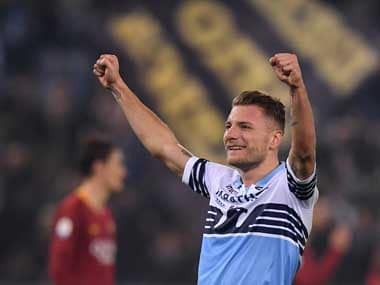 Lazio made their rivals pay 18 minutes from time, as Immobile scored his 16th goal of the campaign only eight minutes after coming on as a substitute. The 29-year-old striker sent Correa running through on goal, with Federico Fazio outpaced and resorting to bringing down the forward, and Immobile squeezed the resulting penalty underneath Olsen. "I dedicate the goal to my wife, who is pregnant," said Immobile, who celebrated by putting the ball under his shirt and his thumb in his mouth. "We're expecting our third child and, after two girls, it's going to be a boy." There was further pain for Roma late on, as a wonderful team move from Lazio ended with midfielder Danilo Cataldi curling home an 89th-minute third goal, before Aleksandar Kolarov was dismissed after picking up two yellow cards in a matter of seconds. Earlier on Saturday, AC Milan took third place in Serie A from city rivals Inter as Gennaro Gattuso's men continued their fine run of form with a narrow 1-0 win over Sassuolo. The seven-time European champions' only defeat of 2019 so far was a 1-0 Super Cup loss to Juventus in Saudi Arabia, and they are unbeaten in their last nine league matches. But Gattuso was disappointed with his side's laboured performance at the San Siro, saying it felt like "a step back". "I take the positive results against Empoli, Lazio and Sassuolo, but we have got to do better," the former Milan midfielder told Sky Sport Italia. "I don't want to talk about fatigue. I want to understand why we aren't sharp enough lately. We struggled against well-organised opponents." 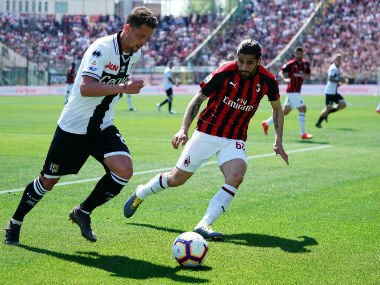 Milan struggled for long periods to break down a stubborn Sassuolo outfit, with Spanish full-back Pol Lirola bundling the ball into his own net for the only goal 10 minutes before half-time. Sassuolo saw goalkeeper Andrea Consigli sent off in the 64th minute for bringing down Krzysztof Piatek when the Polish striker was about to tap into an empty net, although Milan failed to find a second. But it was enough to see them move one point clear of Inter, who were beaten 2-1 at Cagliari on Friday. Runaway league leaders Juventus can all but secure an eighth successive title on Sunday when they visit second-placed Napoli looking to open up a 16-point lead at the top of the table.